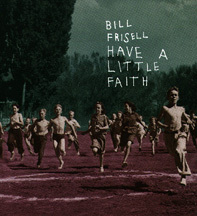 Have A Little Faith is Frisell's take on the American song writing tradition, from Madonna's pop to John Philip Sousa's marching band music and Aaron Copland's ballet scoring. Frisell's take on these tunes is pretty liberal, especially with Copland's "Billy The Kid" score, where Copland's hints at confusion become fully fledged chaos, with Coplands melodies floating around the confusion. However, like most Frisell projects, the score has moments of exquisite beauty, especially on the pensive spaciousness of "The Open Prarie". High points on the album include the moody, haunting cover of Madonna's "Live To Tell", ending in a screeching guitar solo ala Jimi Hendrix. John Hiatt's beautiful ballad "Have A Little Faith In Me" is also done with a quiet reverence. The abrupt silliness of "No Moe" and "Washington Post March" is classic Frisell. These songs ring with an earnestness and a ridiculousness, with the band screeching over "Rhythm Changes" chords in "No Moe", and Frisell taking a distortion crazy solo over the goofy "Washington Post March". The band itself is something unusual; one usually doesn't hear of many guitar-bass-drums-clarinet-accordion bands. However, Byron and Glucevsek's coloring to the group is what makes this album so interesting, and Frisell's orchestration of them works wonders. Glucevsek makes you wonder why we don't hear the accordion more often in music, his long, beautiful chords meld with Frisell's reverby tone beautifully, defying the image of the accordion as a goofy oom-pah polka instrument.